Our doctors use the latest advances in dental technology for thorough and accurate diagnosis, precise treatment planning, minimally invasive treatments and comfortable patient care. Look below and learn what we use to ensure you receive the highest quality treatment and the most stable, long-lasting results. We use digital X-ray equipment which emits far less radiation than conventional X-ray devices and produces sharp, high-resolution images that are available in seconds. 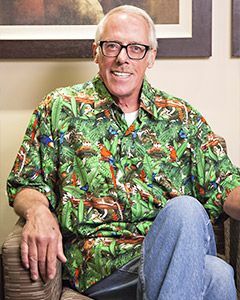 Our doctors can take a much closer look at your gums and teeth using digital X-rays than is possible with traditional film images, as the digital images can be magnified as needed for a more detailed inspection. Our Cone Beam 3D CT scanner takes a series of X-ray images in a 360° circle around your head. The images are computer-processed into 3D 360° views of your teeth and jawbone that the doctors can examine from any angle and magnify for a closer look. These 3D images allow us to accurately evaluate the volume and density of bone present in your jaw without having to use invasive procedures. 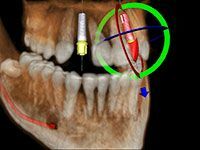 With these images we can precisely plan the placement of your dental implants and any bone grafting that may be needed. Our doctors feed the 3D X-ray images into special software that they use to precisely plan the position, angle and depth of placement for your implants. Using this technology, they can determine the best area of bone in which to place the implant, and they can plan any needed bone grafting ahead of time. Computer-guided implant placement is fast, accurate and minimally invasive. A surgical guide is a template that fits over your dental arch and shows the precise location and angle at which your implants are to be placed. Our doctors use surgical guides to guarantee accuracy of implant placement and to make the procedure faster and more efficient. Using a surgical guide removes the need for preparatory surgery in most cases and thus makes implant placement minimally invasive and faster healing, with minimal or no post-operative discomfort. Our doctors use an advanced dental microscope that allows them to perform delicate, minimally invasive micro surgical procedures due to the microscope’s targeted lighting and up to 20X magnification factor. With this added clarity, they can perform precise treatment in very small areas while preserving maximum surrounding gum and bone structure. The Perioscope is an advanced, high-magnification miniature video camera that is placed into the pockets between your gums and teeth and around dental implants. The camera can magnify images up to 48X and allows the doctors to closely inspect the condition of tissues around implants—which before required periodontal surgery to be able to see. We use advanced digital cameras to obtain a high-resolution, close-up record of your teeth and gums. 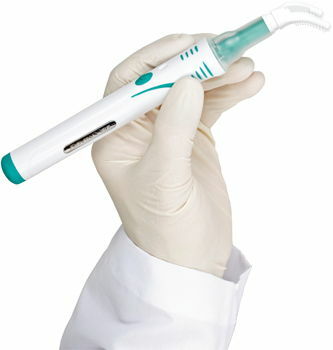 The DentalVibe® is a small vibrating device that is placed onto the gums around an injection site. The device sends a precise vibration into the tissues which blocks any sensation from the injection. The injection is administered while the gums are being vibrated, making the injection virtually painless.